All is well. What a game changer these three little words have been for me. They are simple, certain, and bold. I hear these words in every encounter with my Jamaican friends at Jake’s Hotel where I teach yoga retreats. This resort, located in the quiet, quaint fishing village of Treasure Beach on the southern side of the island, oozes peace, serenity, and “chill.” I have come to know and love many of the hotel’s staff and the locals of Treasure Beach. I find my smile growing wider as these sunny folks somehow always find a way to squeeze “all is well” into every conversation. Not long ago I was completely spellbound by Proof of Heaven, the story of neurosurgeon Dr. Eben Alexander’s miraculous survival after contracting E. coli and his experience of several days in a coma. Upon awakening from near death, Dr. Alexander uttered an uncharacteristic phrase to his family. I had to sit with this phrase—ponder it, pull it apart. I wanted to understand why these three little words were showing up in my life. After a little while, the answer simply fell into my lap. These words mirrored my reality—All really IS well. The sun comes up everyday. I have plenty of food, shelter, and love in my life. I am healthy and happy. All is well. And the rest of it—the drama, the drain—is just small stuff. Here in Jamaica, surrounded by sweet smelling flowers and fresh ocean air, it is exceedingly easy to adopt this state of mind. 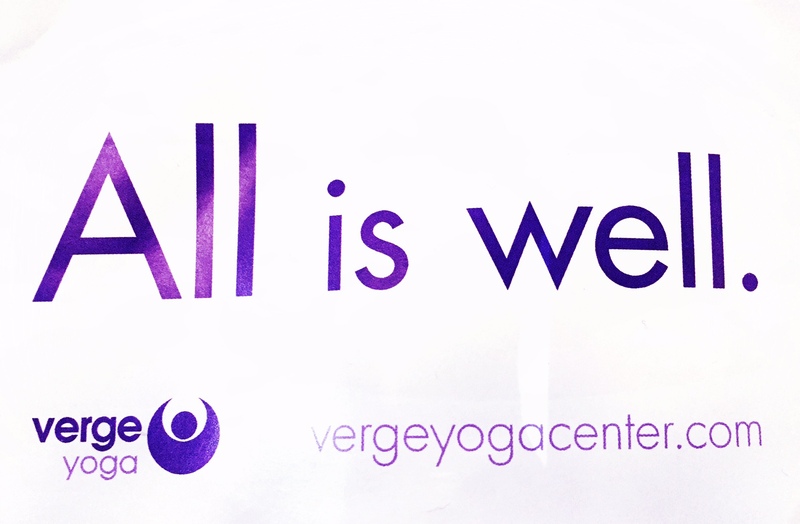 I shared these three words with the other yogis on retreat, and all is well has become our mantra as we flow through a dozen plus yoga practices, settle our minds in meditation, soak up the sun on deserted beaches, and sway and swirl during the reggae nights. When little daily inconveniences arise here and there we remind each other of our new mantra. You see, it IS all okay—life that is. For most of us reading this blog, all truly IS well. We can bring this mantra into our daily lives. We can even expand on the theme with: “My life is as perfect as one could wish.” Try writing “All is well” on some sticky notes and place them where you will see them throughout the day such as on the steering wheel of your car and on your refrigerator, laptop, and pillow. Hold this simple phrase in your pocket and it may just change your outlook on life. It may make you smile more or chuckle louder. You may feel lighter and sunnier. You may even take on the cheerful demeanor of my lovely Jamaican friends. Your new mantra just may fill you with positive energy, happiness, and a new sense of excitement. Ya man… All is well.